Honey extractors are rugged and simple mechanical devices designed to extract honey from honeycombs without actually destroying the honeycomb (Source). The way these honey extractors work is by utilizing centrifugal force- a container or drum that contains a frame basket spins and consequently flings the honey out (Source). The primary advantage of this method is that the wax comb remains intact and the bees can reuse it to make more honey (Source). For the most part they are manually operated, though the Honey Keeper Extractor is a 4-frame, electric-powered option. There are actually two different types of extractors the tangential or radial, and they differ by how the frames are contained in the basket (Source). The 24 lb. Little Giant tan﻿﻿﻿﻿﻿﻿gential honey extractor is a solid choice- with one beekeeper writing that his warm honey came out after 10 minutes of hard and fast spinning. He writes that it took two people to perform the honey extraction- one person to hold the machine as another person manned the handle. It was a pretty raucous affair with a decent outcome. That said, the honey extractor didn't come with instructors and other users claim that the red paint is prone to chipping. So you have to be careful the paint doesn't chip into the honey, contaminating it. Let's take a look at five of the best selling honey extractors in the market today and see how they compare. The Vivo Two Frame Stainless steel bee honey extractor is a decent, but not great, performer for the amateur beekeeper. According to most users the BEE-V002B delivers good value for the price even if it is lacking in some areas. Other users, however, found the build quality to be substandard, even though it features a stainless steel finish and two carrying handles. All in all, the 2 Frame stainless steel bee honey extractor is a decent choice for casual users but insufficient for more serious beekeepers. Most users acknowledge the shortcomings of the 2 frame steel bee honey extractor while admitting it still provides good value for the price given the durability of the unit and its 29-inch drum height and well-designed stopper/honey gate. Other users were disappointed that the crank handle kept falling off and there were some sharp edges on the unit. In general, this 2-frame stainless steel bee honey extractor is an average performer that is made more attractive by its reasonable price. 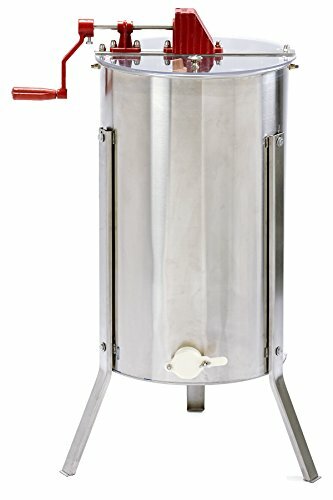 The Best Choice Products 2-frame stainless steel honey extractor is a good choice for beginning and causal beekeepers looking for a solid performer at a good price. Most users found the best choice products steel honey extractor to have good instructions and easy to use with a well-functioning honey gate. Other users, however, found the overall build quality to be lacking and had problems with the packaging. All in all, users looking for a low price, but decent honey extractor, will probably find this to be a good option. Most users of the Best Choice Stainless steel honey extractor praised the unit for the double-sided, clear lid, which allows for easy viewing of the drum and the solid metal crank which provided reliable turning of the drum baskets. Other users, however, noted the sharp edges on the legs and one user experienced missing parts with his shipment. In general, the Best Choice extractor is a good choice for beekeepers looking for a good performer at a reasonable price. The GoPlus 2-frame stainless steel honey extractor is an extractor built specifically for the low budget hobbyists looking for a very basic extractor that can be used for basic honey extraction. Most users acknowledged the shortcomings of this unit but also praised it for the quality value it provides due to its clear lids for easy drum viewing and its decent size. Some users, however, felt the build quality was too lacking to make it a good choice. 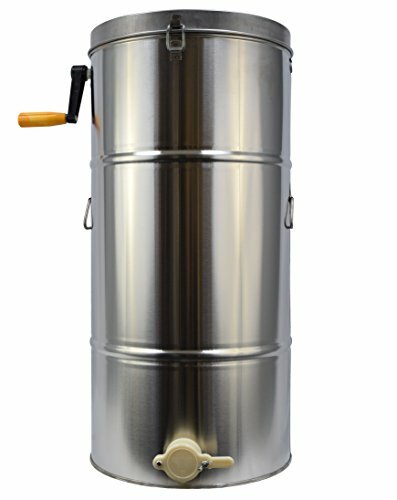 In all, the GoPlus stainless steel honey extractor is a decent choice for beginners looking for a low cost extractor. Most users of the Goplus 2 frame steel honey extractor recognized that this unit is best suited for a beginning beekeeper with low expectations and limited goals. The durability and easy to use nature of this unit makes it perfect for those just starting as beekeepers. Other users, however, found the build quality and designed to be substandard and found that there were no directions for assembly or care of the product included. In general, the Goplus steel honey extractor is a decent choice for beekeeping beginners. The Little Giant EXT2SS Stainless Steel Bee Extractor is a good choice for more experienced beekeepers that are familiar with how to properly use a honey extractor. Most users of this honey extractor liked the tangential extractor functionality, plexiglass lid, and flexibility of the Little Giant unit. However, other users found the build quality to be suspect and lack of instructions frustrating. Most users of the Little Giant found the unit to be a capable performer for experienced beekeepers. Less experienced beekeepers may find themselves frustrated with the unit because it does not come with instructions. Also, some users experienced paint chipping with the unit, requiring careful inspection prior to using it. Still, most users found the Little Giant Farm and AG Extractor to be a capable performer. The last honey extractor we examined is the electric four-frame stainless steel honey extractor-it's designed to handle up to eight shallow, eight medium or four standard deep frames. It's marketed towards beekeepers that want to upkeep several hives at a time- with a leg assembly that can be bolted to the floor. The stainless steel legs can also be removed so he can function as a tabletop extractor, designed to accommodate a 5-gallon bucket fitting beneath for draining.Buyers provide somewhat mixed feedback- with many criticizing the quality of the workmanship and quality assurance, disappointing given that it is one of the more expensive options we examined. Other buyers criticize the ineffectual machining, saying that there was a poor fit between the metal pieces that come for the motors wiring and the motor mounting brackets, with the likely end result being that the wiring will end up exposed and ruined. Another buyer had the unfortunate experience of their unit breaking down as soon as he plugged into the wall- saying it began to smoke and was completely non-operational from the start. As we have observed, the primary reason to use a honey extractor is that you wax comb can be re-utilized by the honey bees-as opposed to crush and strain extraction methods, where the bees will actually have to rebuild the honeycomb structure from scratch. These honey extractors are often ideal for hobbyists who are conducting small-scale harvesting of their locally grown honeycombs. There isn't a huge market for this bee keeping equipment, so some of these extractors often arrive without instructions, are prone to paint chipping, and sometimes require more assembly than their users anticipate. That said, some of the negative reviews these products have received occur as a result of people nitpicking small problems with their extractors- and ignoring the fact that, for the most part, they do the job. Beekeeping, or apiculture, is a trending and artisanal hobby that is practiced in many areas of the world. 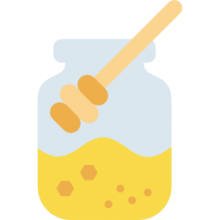 Many beekeepers maintain bee colonies in hives for the purposes of producing beeswax, pollen, royal jelly, propolis, and for the purposes of crop pollination and for selling their bees to other beekeepers. Beekeeping dates back at least 15,000 years with King Tur keeping jars of honey in his personal tomb. In traditional bee keeping, beekeepers used fixed comb hives- and in this case bee combs were unable to be moved or manipulated for honey management purposes. More modern beekeeping methodologies utilize top-bar hives, horizontal frame hives as well as vertical stackable frame hives- all of which have different advantages over traditional methodologies, primarily that they are light-weight, easier to harvest honey from, easier for the bees to live stress-free in and more adaptable. Whether you are a hobbyist, a professional beekeeper, or even in an urban backyard beekeeper, you're probably familiar with the different the colony tasks which consist of a queen bee, many worker bees and male drones. Indeed, with over 20,000 different species of wild bees out there, including carpenter bees, mason bees, bumblebees, giant honeybees and rock bees beekeeping is a practical management practice that is often benefited by the use of honey extractors. 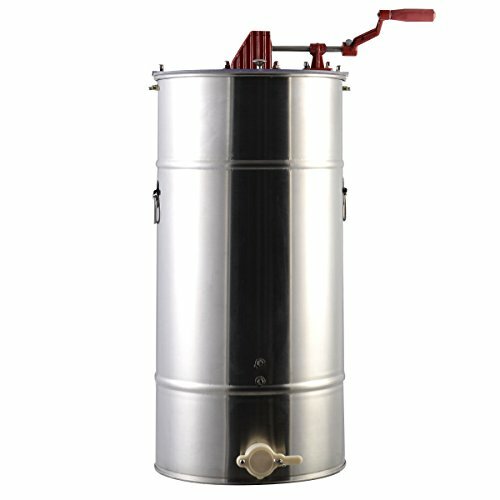 If you are looking to purchase a quality honey extractor, pay close attention to our comparison table at the top of the page, read our reviews, and also check out the individual product pages where you will find other apiaries discussing the pros and cons of the honey extractors that they purchased. The first stainless steel honey extractor we looked at is manufactured by Vivo. It is a two frame option that is designed to accommodate deep, medium and shallow frames. Twenty-nine inches tall with a 13.5-inch diameter, and ships with integrated handles so that you can easily carry it around. Inside of the extractor drum, the shape is conical, which helps to drain the honey out, employing a 2-inch outlet with a honey stopper gate. The manufacturer does indicate that it does not work with top bar hives and also advising that you have to use a separate strainer on the top of the catch bucket. One reviewer who would manually drain their frames decided that this summer season she will purchase an extractor to double down on her apiary hobby. She told us that overall she is pretty satisfied, especially considering the relatively low price- saying that it does have some sharp sheet metal edges, that you do have to install the honey gate yourself, and it does have a bit of grease smell straight out of the box. The second two-frame stainless steel honey extractor we examined is manufactured by Best Choice Products- and measures 16" x 16" x 38". It features a hand crank made of metal that will turn the two baskets efficiently and smoothly. It's marketed towards professional and amateur beekeepers, promising an easy and quick assembly so that you can get up and running extracting your honey quickly. Additionally, because the lid is clear, you can peer inside to observe progress as you are doing the extraction. Once the extraction is done, you just use the honey gate located at the bottom of the extractor to collect it. In terms of cleaning the extractor, you don't have to disassemble it- with many reviewers saying that they allow local bees to clean out all of the remaining honey. And, if that doesn't do the trick, you can use a pressure washer or just some plain old hot water and soap to give it a rinse. Buyers were overall impressed by this option, though as with some of the other extractors we examined, the metal can be incredibly sharp in places, particularly the tripod metal legs. While relatively spacious, some reviewers observe that it is around 2 inches too short in height to fit a 5-gallon bucket into it below the honey gate. The third two-frame stainless steel honey extractor we examined is manufactured by a GoPlus- it's designed to fit deep, medium and shallow frames with clear lids to enable transparent viewing. It is a flat bottomed option that many buyers endorsed as a solid value buy for backyard beekeepers that can hold two shallow supers on each of its sides but is primarily designed for two deep supers. One reviewer said that this is not a professional-grade option- so if you have a bunch of different hives and your goal is harvesting large amounts of honey each year, its a better option to go with something more professional-quality than this one. On the plus side, it is relatively portable because of its side handles, its plexiglass lids easily clean in the dishwasher, the hand crank does turn pretty smoothly and the honey gate worked effectively. On the downside, cleanup can be a bit of a hassle because you will have to remove the crank mechanism, as well as the cage, which requires rebolting it back in place when you're finished. Other buyers say that you should give it a wash after you receive it to clean out any dirt and oils accrued during manufacture and assembly. 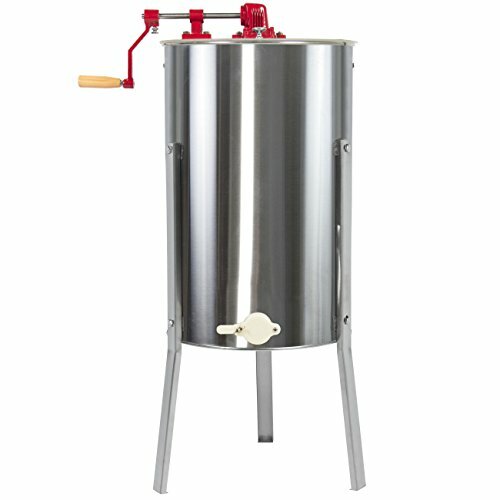 The fourth two-frame stainless steel honey extractor we examine is manufactured by Little Giant Farm- it is advertised as a tangential extractor that easily hand-cranks out superior-quality honey. It's intended to be used with either deep or medium frames, includes an integrated honey gate, legs and cover, with a plexiglass lid so that you can look inside as the extraction is taking place. Some reviewers were somewhat displeased with the quality of the paint on it, saying it has a tendency to flake, which could end up spoiling your honey. Another home bee keeper said his unit didn't ship with instructions, which was especially problematic because when it arrived there were some loose bolts and washers rolling around, and he didn't quite know what to do with them.